I thrilled to say the Jacqueline played along again! You can see her wonderful creation HERE. Thanks so much for playing along Jacqueline! Here is my attempt. I do not have a mum stamp - so I improvised a little. I used this beautiful Victorian Flower stamp by Impression Obsession. 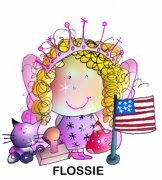 This artist has so many beautiful stamps, including one of my favorite background stamps. 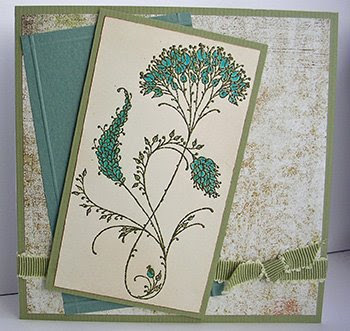 I embossed the image in a sage green embossing powder and colored the flowers with a Prismacolor pencil. I tried to position the image and cardstock to mimic the pillows. 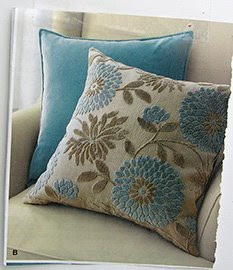 I scored the teal to make the seams of the pillow. The cardstock is Prism. The background paper is from Basic Grey, but I don't remember what line! The ribbon is Basic Grey too (Mellow collection). Oh My! Here is next weeks photo. Honestly - I don't think this was supposed to be in the inspiration shoe box. I think that I tore it out because I thought some of those animals might look cute in the garden. Sigh.... that what comes from being disorganized. If anyone would care to help with this, I'd appreciate it! 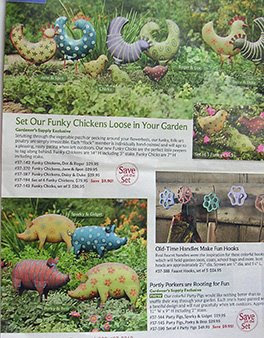 Maybe we can all make funky chicken and spotted pig cards! OH! It's beautiful - I love your background panel to start with and then that beautiful stamped flower - wow - and all that from a magazine picture!! What a beatufiul card, love your take on the inspiration. Wow, Catherine! Your card is gorgeous! I love the vintage look to your card and you did a wonderful job with the inspiration!! Love your card. So very beautiful! Holy smokes, your inspiration is spot on with your card. Awesome. I love those funny pigs. Can't wait to see what you do with that for inspiration. I love your card....such a fun challenge you offer us!! I did your challenge for this week....check my blog to take a peek! I didn't have the right sort of stamps, but I tried for the fun feel anyway!